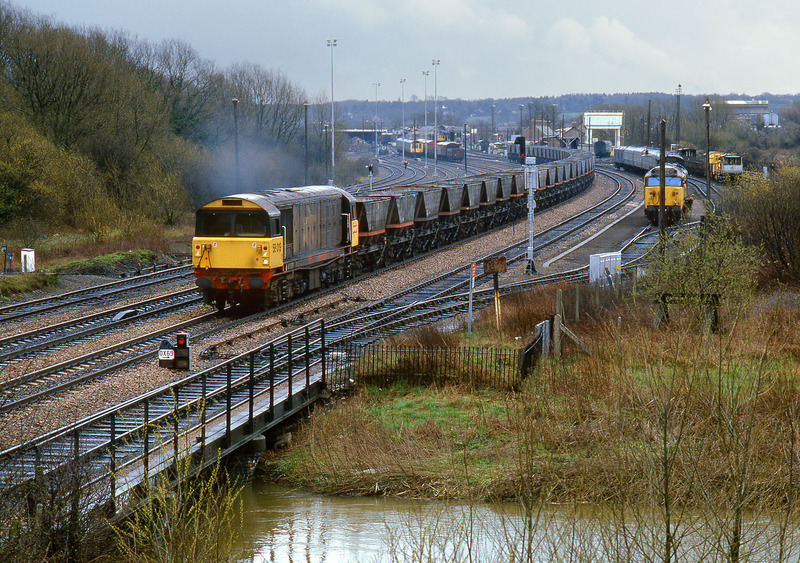 58019 passes through Oxford on 22 April 1986 with the early running 6M53 14:40 Didcot Power Station to Mantle Lane MGR empties. 50010 Monarch can be seen in the down carriage sidings. Unfortunately this view from Walton Well Road, looking across the Castle Mill Stream (a branch of the River Thames) towards Oxford station, has long since been obliterated by trees. Apart from the actual mainline, virtually everything else in this picture has now changed. The gate by the notices in the centre of the picture was once an excellent spot to watch trains, and this is where I stood to see Sir Winston Churchill's funeral train on 30 January 1965, although being only seven years old, I seem to remember being more interested in playing in the stream!